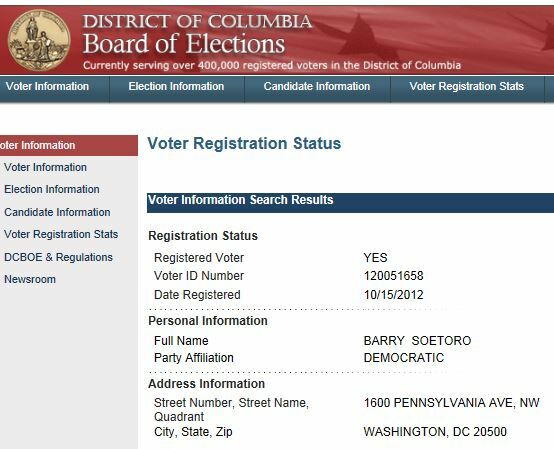 A few weeks ago we reported a bizarre story about Barry Soetoro being registered to vote in Washington D.C.
Soetoro was registered with a White House address and had Barack Obama's August 4, 1961 birthdate. We know that the birthdate was the same because that information was required to do a search. Below is a screenshot of our original findings. WASHINGTON – A few weeks ago, we published an article: "Voter fraud at 1600 Pennsylvania Avenue?" exposing a voter registration under the name Barry Soetoro, the name President Barack Obama used while attending elementary school as a citizen of Indonesia, using the White House's address. It was also pointed out that both Obama and the First Lady are registered to vote in Chicago. A Freedom of Information Act (FOIA) request was submitted on July 22 to the District of Columbia Board of Elections and Ethics (DCBEE) director asking for a copy of the voter registration, if Soetoro voted in the Nov. 6, 2012 election, and what the process is for verifying voter registrations submitted by mail and online. Senior Staff Attorney Terri Stroud responded almost immediately to acknowledge the request and state she would respond to the request on before Aug. 12 by making the documents requested, or a legally segregable portion thereof, available or notify me of her determination not to make the requested document available. Stroud responded on Aug. 12, as promised, denying my request. 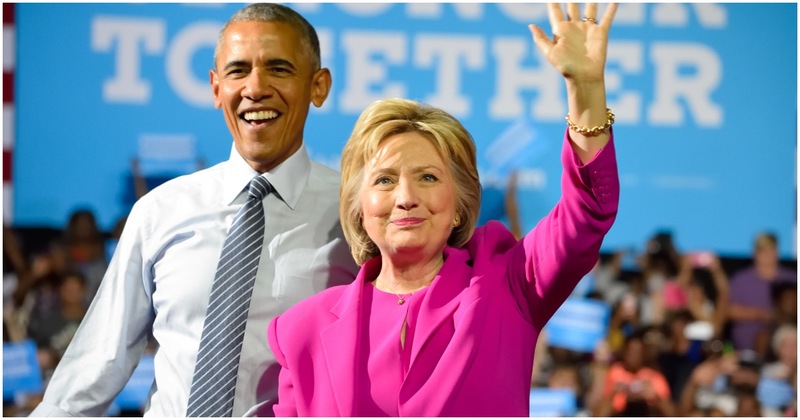 She wrote, "I am writing to inform you that your request for a copy of a voter registration application submitted under the name "Barry Soetoro" is being denied pursuant to D.C. Official Code § 2-534(a)(3), as it is a record which is the focus of an investigation into a specific alleged illegal act which could, if proved, result in civil or criminal sanctions. "With respect to the questions posed in your FOIA request concerning voter history and the Board's process for verifying voter registrations submitted by mail and entered online, under the law, an agency 'has no duty either to answer questions unrelated to document requests or to create documents.' Zemansky v. United States Environmental Protection Agency, 767 F.2d 569, 574 (9th Cir. 1985). The law only requires the disclosure of nonexempt documents, not answers to interrogatories. See Di Viaio v. Kelley, 571 F.2d 538, 542-543 (10th Cir. 1978). "Please be advised that if you deem this response to be a denial of your request, you have the right to appeal to the Mayor, or you may seek judicial review in the Superior Court, pursuant to D.C. Official Code § 2-537 and 3 D.C.M.R. § 2012.1. If you elect to appeal to the Mayor, your appeal should: 1) be in writing; 2) include a statement of the arguments, circumstances, or reasons in support of the information sought by your request, and; 3) include a copy of our written letter issued to you." Just another case of government stonewalling. I am sure that The White House was consulted to see what action should be taken. There is a real possibility that we have a sitting president who committed voter fraud, by potentially voting in both D.C. and Illinois, and we may never know. The Board's regulations direct that any voter whose mail is returned undeliverable is to be deleted from the voter registration list if they do not cast a ballot and fail to respond to notices over the next two subsequent general elections for federal office. However, the Board does not entirely delete any record from its voter registration database. While records of individuals removed from the list of registered voters are marked as 'deleted' and do not appear in the poll book at precincts on Election Day, the record itself remains on file permanently and can be reinstated. District residents are encouraged to register to vote or update their registration using the Board's online tool at www.dcboee.org and to submit their completed voter registration application by mail by August 16, 2010. Between August 17 and August 30, residents can only register in person at the Board's office. Once early voting begins on August 30 and at the polls on Election Day, residents can only register and cast a ballot if they bring with them a current photo ID, utility bill, bank statement, or government document listing their current address. Those individuals will be required to cast a special ballot, which will only be counted if the Board verifies that the voter meets all qualifications and has provided proper proof of residence. So, this voter registration was made in October, which meant that Barry Soetoro had to appear with a current photo ID, utility bill, bank statement, or government document listing his current address. Furthermore, one wonders why the record of his registration is deleted after less than a year. According to the DC Board of Elections, they don't do this. Thus, the plot thickens. So there is a good chance that Barry Soetoro actually voted in the general election. Hopefully out of respect for the process they asked for two forms of identification and he showed a valid birth certificate. I am tired of being called a conspiracy theorist. Any time we come up with one of these stories, we are just hoping that a big conservative media outlet or a congressman will take it to the next level. It never happens. We have evidence that, at the very least, deserves an explanation. But no one with the resources to get any real answers has the required backbone to get it done. So we keep seeking the truth and keep being told we can't have access to it. I wonder who Barry Soetoro voted for? Next Are You Going To Surrender To The Homosexual Agenda?